We’re in the middle of peak tourist season in Coachella Valley, which means there’s always plenty of opportunities for fine dining, fancy banquets, and cool nights on the town. If all that activity has you bringing out the pumps night after night, however, you may notice a bump beginning to form at the back of your heel. This is known as Haglund’s deformity, and is especially common among women. If you do develop this issue, you’ll want to incorporate a few simple strategies into your routine to keep you going without pain. Unfortunately, because the deformity is made from a bony growth, home care will not shrink the bump—but that doesn’t mean home treatments can’t be effective at minimizing your discomfort. Start with your shoes. Haglund’s deformity is often caused by too much walking around in pump-style shoes with rigid backs and high heels, so switch to a pair that won’t put as much pressure on your trouble spots. That means low heels, plenty of arch support, and flexible, breathable materials. Backless designs may be a good idea if you have no additional foot or ankle problems, but don’t use them if you have tendonitis, bunions, or other structural foot deformities. A tight Achilles may be contributing to the bony growth. If so, gentle stretches and exercise can help gradually relax the tension pulling at the back of your heel. You can also use a wide variety of OTC products to help protect your bump or adjust your foot position in order to minimize discomfort. 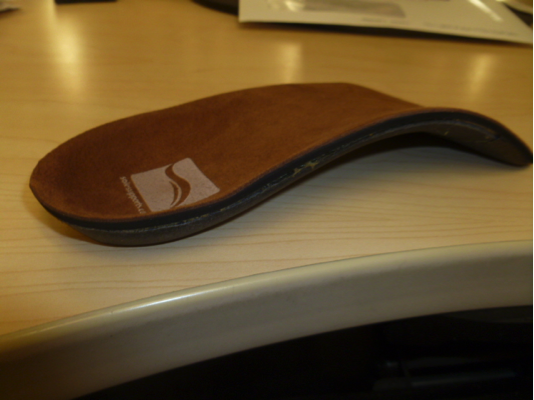 Heel pads provide extra cushioning to relieve some of the pressure, while heel lifts or arch supports can reposition your feet in a more healthy arrangement—these can be especially useful if you have high arches. Of course, when symptoms are particularly acute, standard pain relief strategies apply. Anti-inflammatories (topical or oral, if you can take them safely) and ice packs tend to be the most effective. If too much running around in pumps—or any other reason—is building a bump at the back of your heel, call Harvey Danciger, DPM, today. Whether you just need some old fashioned home care, or could stand to benefit from more advanced treatment methods like laser pain treatment or custom orthotics, he will help you get back on your feet as quickly as possible. Call us at (760) 568-0108 to set up an appointment.